The City of Riverside maintains a ‘Text Only’ website to allow general accessibility using standards set forth by the Worldwide Web Consortium (W3C). Images on this site contain 'alt tags' with descriptions of the image that can aid users who listen to the content of the site by using a screen reader rather than reading the site. While we are committed to making our Website accessible to all users, we recognize that not all of our pages may be ADA compliant at this time. If you use assistive technology and the format of any material on our website interferes with your ability to access the information, please try our Text Only version located at http:/www.riversideca.gov/default.asp. Major reports and other special publications are made available in Adobe Portable Document Format (PDF). For details on how PDF files can be translated to text for screen readers, please visit Access Adobe. We welcome your comments and suggestions on ways we may improve our website's accessibility for users with disabilities. 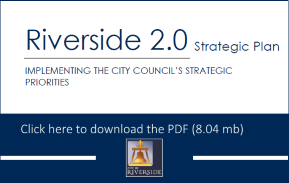 Please email our Webmaster at webmaster@riversideca.gov with any questions or comments. Thank you.